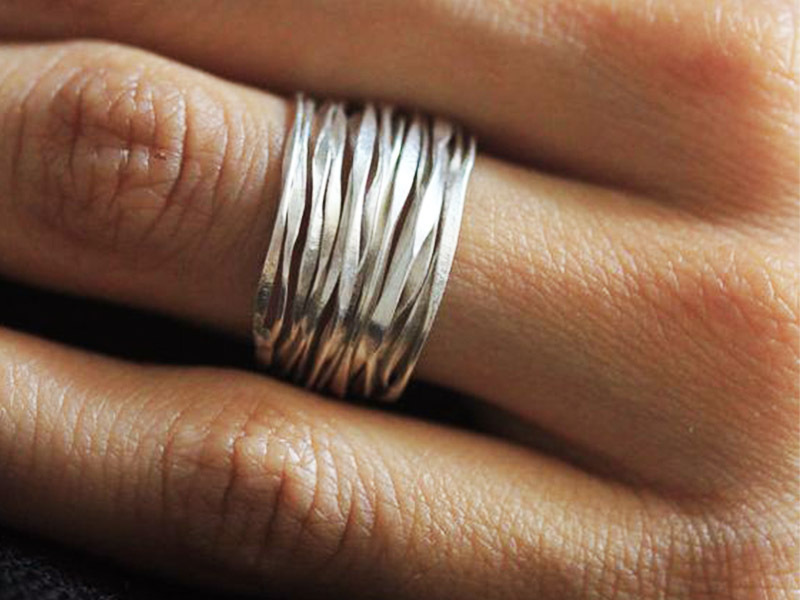 A silver ring is one of the most versatile pieces of jewelry. Simple or with gemstones, a silver ring is a piece of jewelry you can wear every single day and match with any outfit. But nothing is ever as easy as it looks, is it? 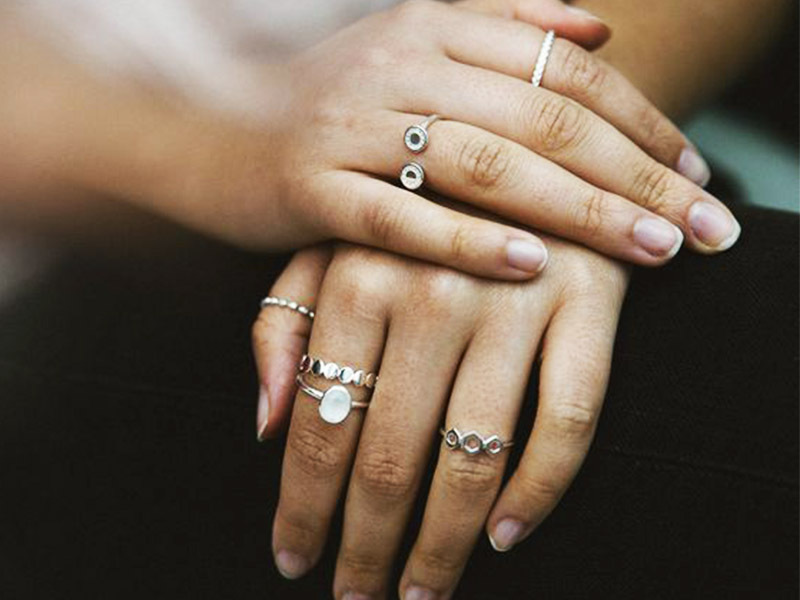 Even silver jewelry has its styling rules as you are about to find out. Read further to discover the essential rules when wearing a silver ring and how you can upgrade your fashion style. This beautiful piece of jewelry should never miss from your jewelry box. Perhaps you didn’t know this, but silver is the most reflective metal, meaning that your jewelry will shine beautifully as you wear it. A silver ring can feature any gemstone as opposed to other metals that don’t work well with certain semi-precious stones. Last, but not least, your silver ring is more resistant to scratches and mechanical shocks than your gold or platinum rings. Of course, it doesn’t have the same resistance as titanium or stainless steel. And since there are so many pros to having a silver ring, let’s talk about the cons as well. The con, to be specific, cause there is only one downside. As you may know, silver tarnishes. This is a natural process that you can only slow down, but the good news is that it is reversible. You only have to pay attention to your ring and, when you see tarnish appearing, make sure you clean it away. When can I wear my silver ring? Because this metal is versatile, you can wear it to both formal and informal occasions. Of course, this also depends on your ring’s design. A silver ring with channel-set crystals or gemstones may not be very appropriate when you go to a rock concert. The same way, a silver skull ring may not be the best idea for a formal gala. In general, the rule is simple. If your silver ring is simple or it features gemstones that are not highly reflective, you can wear it to any occasion. If your ring tends to attract attention either through its shape or the gemstones, leave it for special occasions. How can I wear my silver ring? To be clear from the start, silver works with most clothing items, colors or patterns. But, as it turns out, some choices are better than others. Avoid beige, light orange and tan when wearing your silver ring. This metal works best with powerful dark colors, but you can also wear it with pastels. If you want your ring to catch the attention, choose solid clothes as opposed to patterns. When you decide what types of clothes to wear with your silver ring, you need to be sure of what you want. Do you want your ring to grab all the attention or do you want it to act as a subtle accent? In the first case, wear it with dark clothes to create a contrast. In the second case, wear pastels and integrate the ring into your look. How can I accessorize my silver ring? As opposed to gold, silver is easier to mix and match. 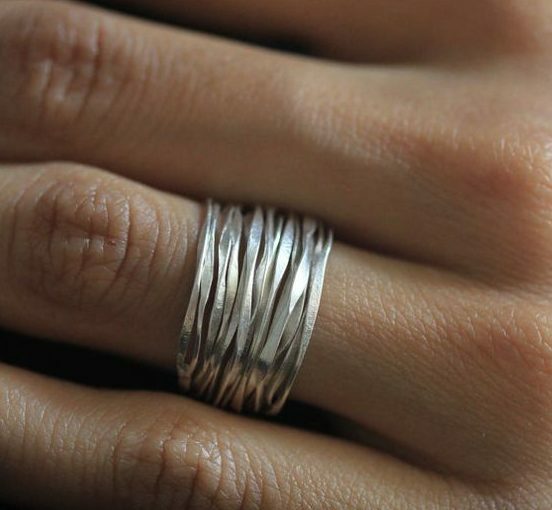 If you are not comfortable layering your gold rings, you can try it with your silver ones. 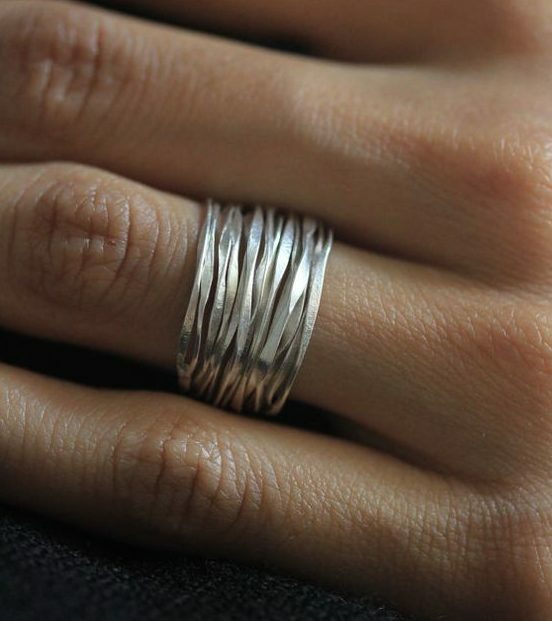 A silver ring has a more subtle color and you can stack it with other rings without looking opulent. 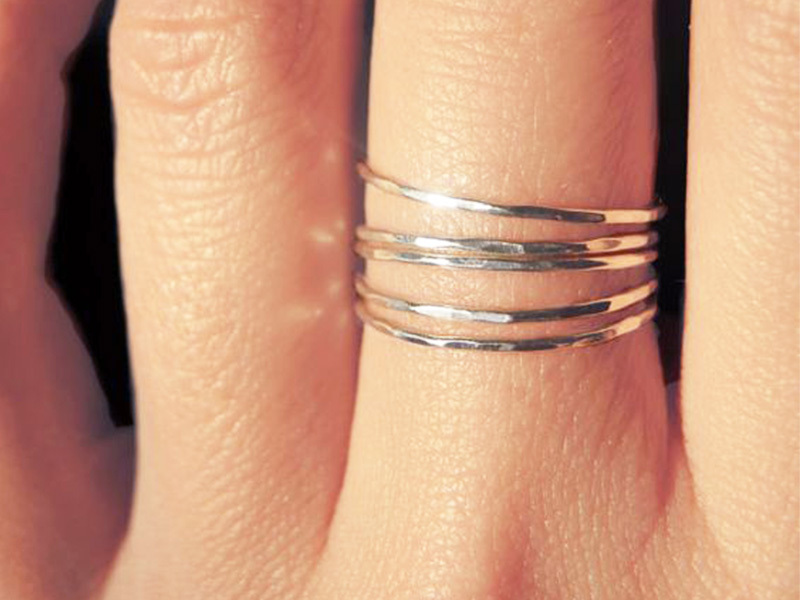 If stacking jewelry isn’t your thing, you can always wear your silver ring with other similarly-looking metals. You can create a wonderful visual effect when you combine silver with stainless steel and platinum. And what about gold and silver? As opposed to a common misconception, gold looks great with silver. The tricky part is combining different pieces so that they form an ensemble. But if you manage to do that, you will obtain a wonderful effect. Last, but not least, silver comes in many textures and finishes. Your silver ring can have an antique finish, making it an elegant piece of jewelry. It can also be matte, which is more appropriate for casual wear and daily occasions. You can have a filigree finish silver ring that offers a feminine and refined look or you can wear a burnished silver ring which exhibits a contemporary air. It’s important to know the difference between those finishes so that you know how to combine your jewelry. A creative idea is to play with them and combine silver jewelry with different finishes. You have to be careful, though, not to overdo it. If you want to read more jewelry fashion and maintenance advice, browse through our other articles. To view our exquisite fine silver jewelry collections, click this link. Ana Luisa offers you designer fine jewelry at fair prices so that you can always have a great style.